There's a soup that I grew up with, which I generally recognized immediately by its bright orange color and distinctively tart aroma. In Chinese, it's called 罗宋汤 ("luo song tang"), which I just realized is the Chinese pronounciation of "Russian" soup. Apparently, after some brief research, it turns out that this Russian inspired soup actually has a name, and it's called borscht. Borscht is traditionally a deep red color because of the beetroots in the soup, but In my family's case, we make a variation of it called orange borscht, which gets its color from the use of tomato paste. Borscht is mainly a vegetable soup, made in our household with potatoes, carrots, cabbage, and onions, with some Chinese sausage as well. 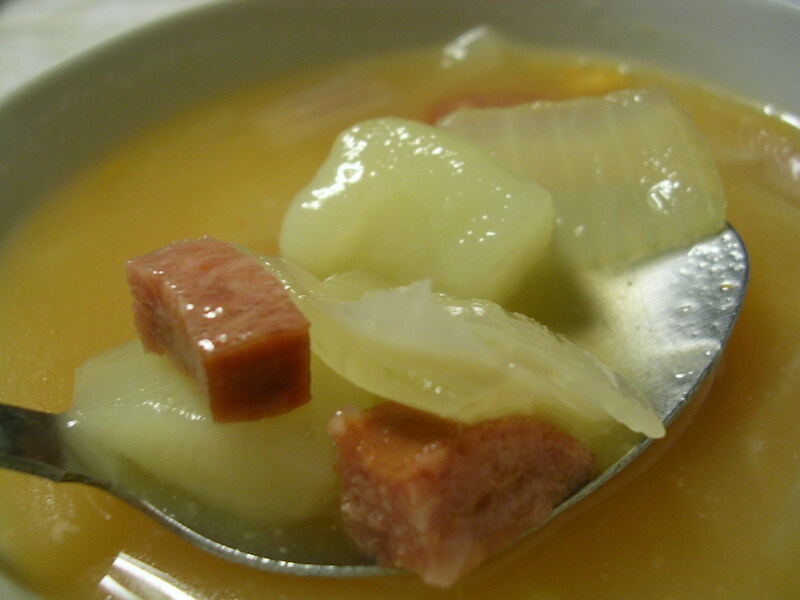 The Polish version of the soup usually uses Kielbasa instead, but like I said, this is Chinese style borscht :) I suppose China being so close to Russia means that there is bound to be cultural exchange within the cuisine. My mom likes to make things easy by using ketchup in this soup instead of real tomato paste, and I think the taste is great either way. It's tart but balanced out by the sweetness of the cabbage, and it's always hot and hearty, great for a cold winter's day. Another fantastic dinner for a cold night is of course, curry. 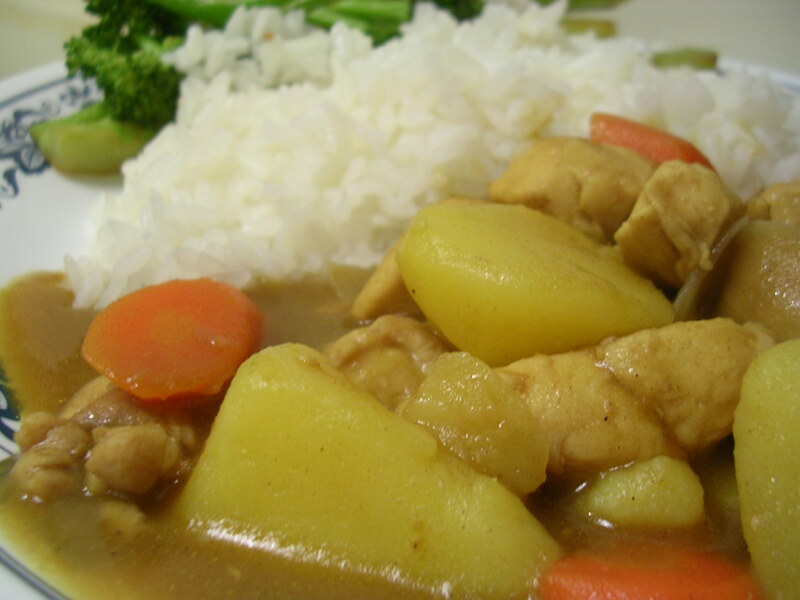 I'm most fond of Japanese curry, which is more savory-sweet than traditional Indian curry, so I make it quite often, which you'll know if you have read my Vox far enough into the past. This time was no different! For a very generous pot of curry (probably serves 5-7 people), we used 4 medium potatoes, 4 carrots, 1 large onion, and about one and a half pounds of chicken (mixture of thigh and breast meat). The curry comes in a box as soft solid cubes (roux cubes) that can simply be dissolved in boiling water to make the curry paste. The taste is indistinguishable from the Japanese curry served at restaurants, and it's so satisfying knowing that there's always more on the stove if you want seconds :) My boyfriend also made a side of garlic stir fried broccoli to go with dinner, so we definitely got our fix of veggies for the day, which is definitely an accomplishment haha. This entry was posted on Sunday, January 20th, 2008 at 8:25 pm	and posted in Chinese, cooking, Japanese, Russian, soups, Uncategorized. You can follow any responses to this entry through the RSS 2.0 feed. « Pepper steak beef, improved! yummm, I have a borscht recipe with dill and sour cream that is really yummy, I don't put the beets in it. Yummy and an excellent winter soup just perfect for this weather. I guess I should pull out the recipe and make some again this week. It has been a long time since I've made it. I have some home made yogurt here, so I'll prolly use that instead of sour cream. Yummm! mmm it sounds good with homemade yogurt! When you find out how to make homemade curry sauce, be sure and let me in on the secret!! !